Here it is, Friday again. Miss Lemon hardly knows where the time gets to. 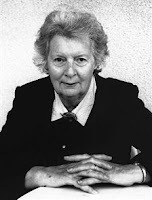 So before this day gives her the slip, she would like to use it to remind her readers of an excellent but now mostly forgotten novel by Margaret Yorke: Death on Account. First published by Hutchinson in 1979 but now long out of print, Death on Account remains an incisive study of the social and psychological forces that drive even the most benignant of persons to commit outrageous crimes. Robbie Robinson is a middle-aged banker. He's never broken into the ranks of management, but he is quite competent at what he does. In the eyes of his bullying wife, Isabel, however, Robbie is a complete failure -- good only for bringing her tea trays in bed at the weekends and fixing things about the house. The childless couple has long stopped sharing a bedroom. When Isabel decides to sell the house that Robbie loves and move the pair to a more pretentious neighbourhood, the sleepwalking Robbie slowly awakens. And what doozies his dreams have been. Robbie works out an elaborate plan to raid his own bank. He tells himself it is only a fantasy. But then he goes ahead with what is -- with one small exception -- a very clever plan. As in any good Margaret Yorke novel, the chain of events that unfold link the most unlikely characters in the most intriguing ways. Robbie, who is not yet unattractive and skilled at woodworking, finds himself involved with the young woman he held up. And the reader can hardly begrudge Robbie this fleeting romance. Indeed, Miss Lemon thought him to be one of the most sympathetic Margaret Yorke villains she's met to date. And much of the tension comes from when and how Robbie's deeds will be discovered. Miss Lemon suspects that Mrs. Yorke's tongue was more than a little in her cheek when she chose the name for her unfortunate protagonist. Clearly, she enjoyed herself while writing Death on Account. The prose is crisp and simple; and at the same time, unsettlingly profound. 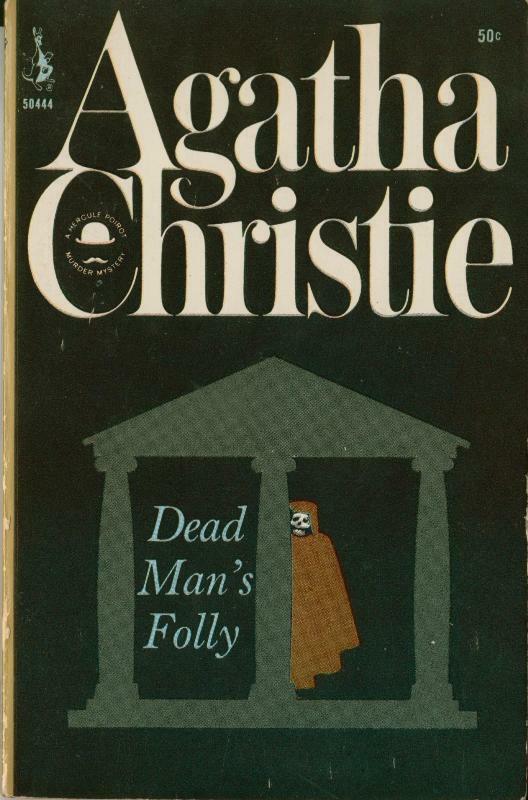 Miss Lemon can't think of a more suitable summer diversion than Dead Man's Folly (1956), by Agatha Christie. The story opens amid preparations for a fête to be given by the new owners of Nasse House, an estate that's stood largely untouched since Tudor times. But the new-moneyed owner, Sir George Stubbs, has other ideas about the house and grounds, particularly those that will please his vacant, young wife, Hattie -- including erecting a folly where it clearly does not belong. Hattie Stubbs, for her part, wants little to do with the planning of the fête, which is to have all the traditional trappings, including a coconut shy, a skittles alley, a fortune teller, and the pièce de résistance, Mrs. Ariadne Oliver's own custom-designed murder hunt. But events take a puzzling turn when the pretend murder victim is found dead in fact -- and Hattie Stubbs goes missing from the fête she never wanted to attend in the first place. Who would want to murder a gawky 15-year-old Girl Guide? And where could Hattie have gone in her perilously high heels and impractical silk frock? "I feel awful," said Mrs. Oliver, sinking down in the chair in front of him like a purple blancmange. "AWFUL," she added in what were clearly capital letters. The Inspector made a few ambiguous noises, and Mrs. Oliver Swept on. "Because, you see, it's my murder. I did it!" It is an especial delight to see Mrs. Oliver in all her scattered splendour, full of outlandish hypotheses and woman's intuition as she tries to work through her own convoluted plot to help solve this clever meta-murder mystery. Mrs. Oliver, acting on her uncanny instinct, has already called in M. Poirot, ostensibly to give away the murder-hunt prizes but in fact to keep an eye out for anything -- or anyone -- suspicious. Indeed, it is the quirky cast of characters -- which ranges from a passel of foreign tourists staying at a nearby hostel and a disgruntled architect to a shady cousin who turns up from Hattie's past -- and not just the bucolic summer setting that make Dead Man's Folly such a delight. You'll forgive her for mentioning it, but even Miss Lemon can boast of a walk-on rôle in this real-life game of Cluedo. The fictional Nasse House is supposed to be situated near Torquay, the birthplace of Dame Agatha, and is in fact modeled on her own beloved Greenway in South Devon. She got the idea for the plot while sitting outdoors, watching her grandson, Mathew, play; and the scene of the inspiration is vividly described in the preface of Agatha Christie's Secret Notebooks -- but don't look unless you are prepared to have the plot revealed! It has not been Miss Lemon's habit to participate in Forgotten Book Friday (rely on Hannah Stoneham and Mysteries in Paradise for excellent posts on the subject); but it is high time she started. With that in mind, she respectfully submits Mrs. Craddock (1902), by W. Somerset Maugham. Yes, yes. Miss Lemon knows that Mr. Maugham is hardly a forgotten writer. Even so, she would be willing to wager a note or two that a few of the most devoted students of early twentieth century British literature have not read this provocative novel. 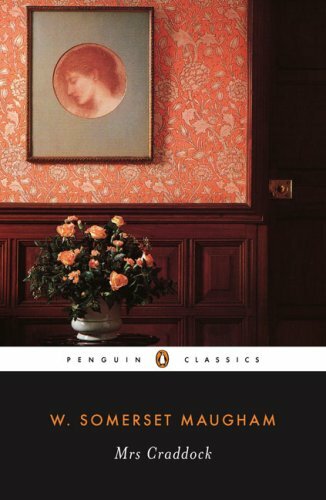 If, however, those same devotees have read Gustave Flaubert's masterpiece, Madame Bovary (and appreciated its genius), they will most certainly appreciate Mrs. Craddock. Bertha Ley, heir to the decaying estate of Court Leys, determines to marry beneath her. Though only one person close to Bertha is fool enough to oppose her engagement to the tenant farmer Edward Craddock, she won't be swayed. What follows is a painful disillusionment -- both for Bertha Craddock and for the mesmerized reader. Edward is not only insensitive and oafish; he is willfully anti-intellectual. Oh, and he detests the French. He is everything that Bertha is not. And yet Bertha cannot stop loving him. When Edward decides to run for public office, Bertha is appalled. He has no training in public speaking or rhetoric. What's more, he has no understanding of history or public affairs. But when his rambling, patriotic rant is received with thundering applause, and he thumps the radical candidate at the polls, Bertha can do little more than sigh. No one, it seems, sees what she sees. And of course, this union cannot end well. Although Bertha's fate is somewhat less operatic than Emma Bovary's, it is no less tragic. What truly empathetic (and bibliophilic) reader, Miss Lemon asks, will finish this novel and not think, "Bertha Craddock, c'est moi!"! Although written in1900, his editors decided to delay publication of Mr. Maugham's second novel after the successful Liza of Lambeth for fear of it being perceived as risque and immoral. Miss Lemon suspects that what really had the publishers worrying was Mr. Maugham's withering portrait of conservative provincialism, especially among the county set. But they wouldn't have worried if he had written something convincing, would they have? Now if Miss Lemon goes on any longer, she shall have to re-name this post Forgotten Book Saturday.